Today's post is a little different. I am not going to show you any fun thrifty finds. Instead, I want to take you back to the basics of doing little things to live frugally. I started this blog to kind of keep me on track regarding living a thrifty lifestyle. It has changed through out the last year and half but, that doesn't mean I have stopped trying to live on a very tight budget. I realized, however, that by just sharing with you my thrifty treasures, I am only sharing one small portion of our lives. Let's talk a little bit about my thrifty treasures. First of all, I have shared with you that both Troy and I have a "thrifting allowance". That amount has changed several times depending on our current income. For instance, our recent thrifting adventure gave us a huge truckload of thrift finds. We were very fortunate that we just happened onto some amazing yard sales! The most expensive thing we bought we paid $5.00 for and that was a Christmas present for a friend. And that was the only item we paid over $1.00 for! That total haul (truck bed and cab filled with stuff) was under $90.00 total. So, how did we pay for it all if our allowance is only $15.00 a week? Well, Troy hadn't used any of his thrifting money in 3 weeks and I had mine for the last two weeks. That gave us $75.00 to play with. Since we also bought some presents for others, I dipped into my "gift fund" for the extra $15.00. Also, in this haul of treasures was about $15.00 worth of winter clothes for the Princess. Which is a whole different "fund". And about $25.00 was spent of gifts for others. Then about $7.00 was spent on items to be used for our Herb Business. And approximately, $25.00 was used to buy things for me to repair/repurpose/clean up to resell. So, about $70.00-$75.00 of all of our purchases were not for us to just have for fun things. However, with the exception of getting $15.00 out of the Gift Fund, the rest of the money was our thrifting allowance. We decided not to take extra money out of say the clothes fund for the princess's items since we had the cash in our wallets. Fortunately, we really love to thrift. We can keep within our budget and still have a lot of fun. Even if it is buying for someone else or knowing we are going to resell it, we enjoy the thrill of the hunt. I know a lot of you are watching your budgets as well. We all have a different level of frugality. But, I think it's safe to say, we ALL like to save our money if we can. If for nothing else, to spend it on something we enjoy instead of sending it to the Electric Co. In order to even have our thrifting allowance means I need to constantly be thrifty in other areas of our lives. I subscribe to several thrifty newlestters. One of them is The Dollar Stretcher. 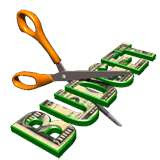 I am always looking for ways to save money and improve the quality of our lives while living on a limited budget. Below is part of a recent article at The Dollar Stretcher. They listed a few very simple ways to help to cut some expenses. Eat your own food. That's it, in a nutshell. Most of us will save a lot of money. Pack a lunch, make dinners ahead, etc., but don't eat out very much at all. It'll be more special when you do get around to it. For extra savings, cook mainly from scratch with items you've purchased on sale and cut out the packaged foods. Keep a garden. Don't waste energy. This covers a lot of areas. One timely example is gas. Do errands on the way to other errands on the way to work. Don't make a lot of single trips. In the house, turn off lights, televisions, and computers when you aren't using them. Ensure your weather-stripping is good. Caulk leaks, tighten faucets, and don't excessively water your plants. Turn down your thermostat two degrees in winter and up two in the summer. Turn your water heater down to 120 degrees. Don't waste time. I suspect a lot of people, like me, dabble with the idea of being frugal a long time before they actually do something with all that web-acquired knowledge. Use some of it! Start doing something today and build on it, whether it's making your own pizza or writing down what you spend. Don't be afraid. You will not end your days in a house crammed with stacks of newspapers because you start cutting coupons. Thrift has gotten a bad rap. Remember, thriftiness and stinginess are two different mindsets in a mentally healthy individual. In fact, thrift can provide a path to being extra generous to others in need by freeing up resources to lend a hand. If family members or friends needle you about your penny-pinching ways, steel yourself and have a sense of humor about it. Realize that you are "bucking the system" in your own way and be proud of your independence. Without confidence, your progress will be slow. Use it up, make do, make it last, or go without. This is pure thrift poetry. Turn over the shampoo bottle for the last bit. Wear last year's coat this year. Use a lip brush to get the last of the lipstick in the tube. Live without soda or cable. Live with the avocado refrigerator another year. The longer something can be used or its purchase deferred, the longer money is in our pocket. If we use less over time, we spend less. By following these five basic but very important tenets, you can become frugal now, as in today. Switch off the computer (and turn off the power strip) and prepare your family some dinner to eat at home and you will be following the path blazed by all those Super Frugals before you. It's up to each of us how long we want or need to make the journey to a more thrifty life. Oh, and just so you understand, I have no affliation with the dollar Stretcher. I just used them as an example. Nice post - and so inspiring, Diann! Diann I am with you on being frugal. I have had to live like this most of my grownup life. I was able to raise two wonderful daughters and they both learned the value of money because we had so little. I am now living on a very small income and I can do it because I know how! I would choose to be frugal (not stingy big difference I agree) and another thing living like this has enabled me to help others even on my limited income. It's all about choice! Great post! Another great post. I've always been thrifty but am even more so since we retired. Since finding your blog I've learned so many new tips. Thanks for sharing. I love being thrifty! I am always looking for ways to save. Just yesterday I needed to get some allergy medicine for my son. I went to the manufacturers web site and found a coupon to get $1 off. I printed it out and then went to the store to get it! If I can save a dollar here and a dollar there it adds up to a lot of dollars saved! Thanks for this post with great reminders of why it is important to be thrifty, and I appreciate your tips on how to be thrifty. Sometimes the little things can be so helpful in making our money stretch. Thanks for the push to do more "thrifty" things. Thanks for the great tips!! Being thrifty is one of my greatest goals in life! I am taking being more thrifty as a challenge. I recently found a gift my daughter had wanted for more than 50% off. That's her Christmas gift. I really plan to watch what I buy. Use it up is my new motto. Thanks for the tips. Dianne I have had to be frugal most of my life. I raised three children on my own. I met my hubby later in life and he has no clue how to be poor. But he is thrifty. He can find discounts that are unbelieveable. We are far from being poor now but I still thrift like crazy because I feel it saves our earth and just makes good sense. I just loved this post and all the information that was shared here. I find I'm so attracted to blogs and articles that share these types of posts and ideas to help me make my house a home. As you know Diann, Randy was unemployed for almost two years. During that time, I did continue to go yard saling. Some have commented that this is an 'addiction', or I'm a hoarder...well in some ways they are right,,I believe this is a 'healthy' addiction. and I'm a 'neat hoarder', lol. Most of my items are used for gifts. I start shopping for Christmas presents in the summer at yard sales. Many of the clothes I purchase for my hubby, daughter and I (sometimes the older boys too) are from yard sales. The daycare children are also blessed with new toys, crafts and books from the yard sales. Saving me TONS of money if I bought in the stores. I also recycle MANY of my items. At least once a month, IF not twice a month I bring boxes to Redeemer Goods (similar to a Goodwill). I know it is going to a good cause, it is also helping other family's who are struggling to provide for their family.